The original. Replaces any gate valve or eccentric plug valve. Same end-to-end dimensions, but with the convenience of quarter-turn, dramatically lower torque, and the corrosion-resistance of Teflon® fused .008" into the solid iron ball. 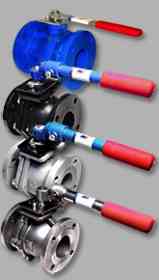 A revolution in ball valve technology. Click here to download catalog. Face to face and flanged dimensions conform to the ANSI standard B16.5 raised face, which exactly match end to end dimensions of carbon steel ball valves, ductile iron gate valves, and plug valves. Blow-out proof stainless steel stem. Adjustable length/removable handles to fit into areas of limited space. Lockable in full open or closed positions. Mounting pad for easy actuation. Available in sizes 2 " through 10"
This cast iron ball valve has been engineered to replace Eccentric Plug Valves, Carbon Steel Ball Valves, and Carbon Steel Gate Valves.